Conservative targets of a Democrat-launched John Doe investigation have described the secret probe as a witch hunt. . . Subpoenas also demanded the conservatives’ bank records, “emails from every major private email provider” and other information in what some have described as a mini-NSA (National Security Agency) operation in Wisconsin. . .
Chisholm, a Democrat, launched the dragnet two years ago, and, according to court documents, with the help of the state Government Accountability Board, the probe was expanded to five counties. The John Doe proceeding compelled scores of witnesses to testify, and a gag order compelled them to keep their mouths shut or face jail time. . . Among other documents, prosecutors sought “all call detail records including incoming and outgoing calls,” “billing name and information,” “subscriber name and information including any application for service,” according to the conservatives’ court filing. . .
“Thus, a target’s mail from well before those dates could be seized if it was simply ‘stored’ in the account during the relevant period, including in the deleted items folder,” the plaintiffs’ court document states. I wish he would have just lied. But worse than his admission that he has no strategy, was his position — classic too-clever-by-half Obama material — that it would somehow have been inappropriate to have a strategy for dealing with ISIS. That’s utter nonsense, as confirmed by the White House making the rounds today emphasizing that, despite what the president said, they absolutely, positively, really, really do have a strategy. Be it so. This burning of widows is your custom; prepare the funeral pile. But my nation has also a custom. When men burn women alive we hang them, and confiscate all their property. . . Let us all act according to national customs. But according to the report’s author: ‘several staff described their nervousness about identifying the ethnic origins of perpetrators for fear of being thought racist’. . . This went on for sixteen years with the full knowledge of the authorities, who would rather allow thousands of children to be raped than called racist. And that fear seems to persist even in the wake of this horror. Even in a story that centers around the horrifying consequences of hyper-sensitivity to racism, this BBC story can’t bring itself to say precisely what the authorities were being hyper-sensitive about. The story has no photographs of the perpetrators, it never uses the word “Pakistani” or even “Middle Eastern”, and it only even uses the word “Asian” (60% of the world’s population) as part of a quotation. Perhaps they need to consider the possibility that there are worse things than being thought racist. Of course, if that idea were to spread, a powerful tool of social control would vanish. Alas, over sixteen years every one of them must have considered that possibility at some point. And rejected it. The legal system is, ultimately, an ancient bargain: Renounce your mob violence and blood feuds and we will provide you with justice. It could be argued that such a default as this calls the whole bargain into question, and justifies self-help along ancient lines. “Social pollution.” What a lovely term that is. Venezuela’s food shortage is so bad the country is mandating that people scan their fingerprints at grocery stores in order to keep people from buying too much of a single item. UPDATE (9/2): Is the phrase “critics said” really necessary here? Critics said the new system is tantamount to rationing and constitutes a breach of privacy. Mothers Against Drunk Driving can be bought off. “[T]he Conservatives are all over Bergdahl and using it against Obama,” Durand wrote, “and my concern is that this book will have to become a kind of ‘Swift Boat Veterans for Truth'” — a reference to the group behind a controversial book that raised questions about John Kerry’s Vietnam War record in the midst of his 2004 presidential campaign. It’s interesting to see a publisher admit openly that it is more interested in protecting Obama than in making money. POSTSCRIPT: The original Yahoo article isn’t loading now, but it’s still in the Google cache for now. Under the Obama administration, “FOIA Denial Officer” is an actual job title. A leaked document from the campaign of Michelle Nunn, the Democrat running for Senate from Georgia, is frank about their plans to win by cobbling together a coalition of various minorities. According to my skim of the document, it almost completely ignores issues and policy positions. The only three ways that issues come up at all are (1) in the context of groups of people to appeal to or at least to neutralize (that is, farmers, gun owners, and small business owners), and (2) a schedule of when to decide what Nunn believes on various issues (too bad for “rural issues”, which somehow comes in #22 on a list of 21 issues on page 62), and (3) Obamacare’s cancellation notices, which (page 141) are totally not at all a bad thing. It’s been clear for some time that the Democratic party has nothing to offer the people at large, and is merely a coalition of tribes, but it’s striking to see it all written out so frankly. The same judge and prosecutor who let professional football star Ray Rice avoid a trial after beating his wife unconscious are pushing forward with the prosecution of Shaneen Allen, a single mother who carried a gun into New Jersey without realizing her Pennsylvania permit didn’t apply there. He was for food before he was against it. His argument was that we should improve yield from existing farms, rather than create new farms, as if agriculture was an either-or proposition. 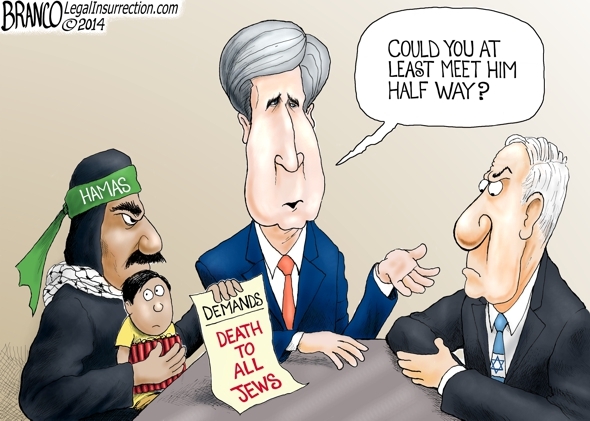 At some point idiots become functionally indistinguishable from monsters, and Kerry is well past that point. On Wednesday, Qaraqosh, the largest Christian town in northern Iraq’s Nineveh province, came under assault from the Islamic State, and all 50 to 60,000 of its residents have fled to Erbil in Kurdistan. . .
We urge all parties to the conflict to allow safe access to the United Nations and its partners so they can deliver lifesaving humanitarian assistance, including to those Iraqi families reportedly encircled by ISIL on Mount Sinjar. We urge them?! Does the administration think ISIS is doing this by accident? Democratic presidential hopeful Barack Obama said Thursday the United States cannot use its military to solve humanitarian problems and that preventing a potential genocide in Iraq isn’t a good enough reason to keep U.S. forces there. . .
Obama, a first-term senator from Illinois, said it’s likely there would be increased bloodshed if U.S. forces left Iraq. . . I also spent some time on the phone with Hyatt representatives. Well, most of that time was on hold, actually, but I did eventually get two bright, human voices. Both of them assured me no political line was being enforced. Oh good. Your criteria blocks Drudge, Instapundit, and Power Line, while allowing Daily Kos and Talking Point Memos, but since you say it’s not political, we won’t worry about it. The LightSquared debacle still isn’t quite over; the remains of the politically connected company are now suing the government over its denial of a permit to operate. Since I was strongly opposed to LightSquared’s effort to make money by breaking GPS, I thought I should note Richard Epstein’s contrary take. Epstein is a very smart guy, so maybe there’s something to this, but I don’t see how to reconcile his position with the expert testimony on LightSquared’s scheme. Over the past 2-1/2 years, the Obama administration has published hundreds of rules — on how wheelchairs should be stowed aboard U.S. aircraft, how foreign trade zones should be regulated, how voting assistance should be provided for U.S. citizens overseas and so on. There’s a problem, however: Technically speaking, these and about 1,800 other regulations shouldn’t be in effect, because they weren’t reported to Congress as required. Yet there is little that lawmakers or the courts can do about it. . . Under a 1996 statute, most federal rules are supposed to be reported to the House and Senate in paper form and to the Government Accountability Office electronically. But since the start of 2012, that hasn’t happened for many of the regulations put out by the Obama administration, either because of bureaucratic oversight or because they were considered too minor to be reported. . . But there’s another catch: Congress also barred such rules from judicial review. Two federal appeals courts and two district courts have upheld this principle even when the regulation in question was not submitted to Congress as required. Since Congress cannot pass a resolution of disapproval for a rule until it receives it, this means neither lawmakers nor the courts can step in and demand that agencies submit the required paperwork. Iron Dome can do anything! Democratic Kentucky Senate candidate Alison Lundergan Grimes says Israel’s Iron Dome missile defense system prevents Hamas terrorists from tunneling into Israel. Grimes was asked about foreign policy and the conflict between the Israelis and Hamas during a recent interview with the Lexington Herald Leader. . . “The Iron Dome has been a big reason why Israel has been able to withstand the terrorists that have tried to tunnel their way in,” Grimes was quoted as saying. In her 297 pages, Rachel Carson never mentioned the fact that by the time she was writing, DDT was responsible for saving tens of millions of lives, perhaps hundreds of millions. DDT killed bald eagles because of its persistence in the environment. ”Silent Spring” is now killing African children because of its persistence in the public mind. Public opinion is so firm on DDT that even officials who know it can be employed safely dare not recommend its use. DDT is a victim of its success, having so thoroughly eliminated malaria in wealthy nations that we forget why we once needed it. But malaria kills Africans today. Those worried about the arrogance of playing God should realize that we have forged an instrument of salvation, and we choose to hide it under our robes. As Josh Billings once wrote (but is often attributed to Mark Twain), it ain’t so much the things we don’t know that get us into trouble. It’s the things we know that just ain’t so. We know that DDT is dangerous, but, used properly, it just ain’t so. POSTSCRIPT: In a Terry Gross interview I had the misfortune to hear on the radio, she alleged that DDT was toxic to humans. Not so. (That’s not even what Carson charged! Carson accused DDT of being bad for birds, not humans.) In fact, the best use for DDT is to use it precisely where humans reside. Alas, the interviewee failed to correct Gross, perpetuating this misinformation. The CIA’s top officer in Kabul was exposed Saturday by the White House when his name was inadvertently included on a list provided to news organizations of senior U.S. officials participating in President Obama’s surprise visit with U.S. troops. The White House recognized the mistake and quickly issued a revised list that did not include the individual, who had been identified on the initial release as the “Chief of Station” in Kabul, a designation used by the CIA for its highest-ranking spy in a country. In the Plame-Armitage affair — the left’s mythology aside — Plame was only technically covert (she worked in America), and her name was accidentally leaked by the State Department. Here we have the CIA station chief in Afghanistan, a real target if there ever were one, being leaked by the White House. Of course, there’s no suggestion that his name was leaked out of malice, but that didn’t happen in the Plame-Armitage affair either. This is technically true, insofar as the Bush administration wanted to discredit Joe Wilson’s lies and contemporaneously Plame was exposed. But the clear implication, that the two events were connected, is an OUT-AND-OUT LIE. The Washington Post, where the offending article appeared, knows this perfectly well. They ran this editorial lamenting the Democrats “myth-making” in 2010, so they have no excuse for signing onto the myth now. UPDATE: “When Bushies blew a CIA cover, it was ‘treason’; now, it’s a mistake.” Indeed. 1. The First Amendment protects you from government sanction, either directly (by criminal prosecution) or indirectly (when someone uses the government’s laws and the courts to punish you, as in a defamation action). It is currently in vogue to exclaim “NOBODY IS ARGUING OTHERWISE” when someone makes this point. [Expletive.] People are consistently saying that private action (like criticism, or firings) violates the First Amendment, either directly or through sloppy implication. . .
2. The phrase “the spirit of the First Amendment” often signals approaching nonsense. So, regrettably, does the phrase “free speech” when uncoupled from constitutional free speech principles. In regard to #1, he has a point. People often say “my First Amendment rights are being violated” when what they really mean is “I am being censored.” Some people with a weaker understanding of civics may actually be confused on this point, but most I think are just speaking sloppily. But White goes wrong in #2. I’ve never heard the phrase “spirit of the First Amendment” used, and when I google it, the first hit is to a Cato Institute article that is clearly talking about government censorship, so let’s skip that point and move on to his next one: that “free speech” is nonsense when uncoupled from constitutional principles. Congress shall make no law . . . abridging the freedom of speech. . . Note the wording: “the freedom of speech”. The freedom of speech already existed in English law, and the First Amendment merely writes it explicitly into the US Constitution. (It’s a pity the English never did that!) It’s manifestly untrue that free speech is meaningless apart from the Constitution. I think White would say that he already knew that, and was writing sloppily. But more substantially, he’s wrong a a philosophical level. White believes that free speech is coextensive with the First Amendment, but I think most Americans understand otherwise. Certainly I do. We ought not to conflate free speech with the First Amendment, because free speech is much broader than the First Amendment. The First Amendment (together with the 14th) protect us from government censorship, but that doesn’t mean that government censorship is the only kind. So what is censorship? These terms [that is, “spirit of the First Amendment” and “free speech”] often smuggle unprincipled and internally inconsistent concepts — like the doctrine of the Preferred+ First Speaker. The doctrine of the Preferred First Speaker holds that when Person A speaks, listeners B, C, and D should refrain from their full range of constitutionally protected expression to preserve the ability of Person A to speak without fear of non-governmental consequences that Person A doesn’t like. I haven’t heard of this doctrine, and the first four pages of google hits all refer to White’s article or derivatives of it (or are random junk), but I’ll assume that it’s a real, obscure legal concept, and not something that White just made up. Anyway, I don’t think that’s what “free speech” means. I think free speech means this: If person A wants to communicate with person B, who is willing to receive the communication, it is wrong for person C, a third party uninvolved in the communication, to interfere. This is just a first-cut; it may need some refinement (national security, juveniles, crowded theaters, etc. ), but I think it works pretty well. If Alice asks Charlie to carry a message to Bob, Bob has every right to refuse. But if Alice is speaking to Bob, Charlie has no right to stop her. Similarly, if David agrees to carry a message from Alice to Bob, it is wrong for Charlie to stop him. This applies whether or not Charlie is the government. If Charlie is the government, the First Amendment applies. If Charlie is just an ordinary busybody, Alice doesn’t have any First Amendment protection, but it’s still wrong for Charlie to interfere with her speech. That’s what was going on in the Duck Dynasty affair. Phil Robertson critics were trying to censor him; they had no part in his communication with Duck Dynasty’s audience. On the other hand, A&E was involved, so they had a right to cancel his program. (If the audience dwindles, they surely will.) Nevertheless, by doing so in that situation, they were knuckling under to censorship. As Americans they should have done better. Thailand’s new military junta announced it suspended the country’s constitution Thursday. The news came a few hours after Thailand’s army chief announced a military takeover of the government, saying the coup was necessary to restore stability and order after six months of political deadlock and turmoil. But, unlike the 2009 non-coup in Honduras, in which Democrats demanded that the ousted president be returned to office, no one seems to care much. Evidently coups (or, in Honduras’s case, extraordinary legal steps) are only a problem when communists are being turned out of office. Someone ought to be prosecuted, but I expect no one will even be fired. Justice Department lawyer Bradley Heard was in court today trying to stop Kansas from ensuring that only citizens register to vote. Kansas Secretary of State Kris Kobach, relying on a United States Supreme Court opinion of last year, asked the federal Election Assistance Commission to permit him to ensure that only citizens were registering to vote. 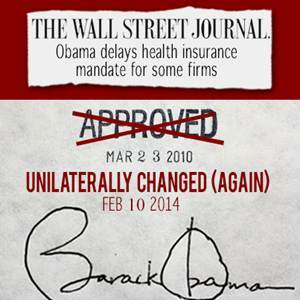 The Obama administration has been utterly consistent on this issue. They are always against any measures to protect the integrity of elections. It doesn’t take a lot of imagination to draw an inference from that. Volkswagen workers in Chattanooga, Tenn., have rejected the United Auto Workers, shooting down the union’s hopes of securing a foothold at a foreign-owned auto plant in the South. “Outside special interest groups”? The UAW is the outside special interest group. How do you say Obamacare in Spanglish? The Associated Press reports “the translations were so clunky and full of grammatical mistakes that critics say they must have been computer-generated.” The situation is even worse when applicants begin digging into then nitty-gritty of the plans. “When you get into the details of the plans, it’s not all written in Spanish. It’s written in Spanglish, so we end up having to translate it for them,” Adrian Madriz, a health care navigator in Miami, told the AP. From a Republican, this would be proof of racism. Every single 501(c)(4) group that the IRS selected for audit was conservative. Imagine that. It’s getting difficult and slinking toward impossible to defend the Affordable Care Act. The latest blow to Democratic candidates, liberal activists, and naïve columnists like me came Monday from the White House, which announced yet another delay in the Obamacare implementation. . . Defending the ACA became painfully harder when online insurance markets were launched from a multi-million-dollar website that didn’t work, when autopsies on the administration’s actions revealed an epidemic of incompetence that began in the Oval Office and ended with no accountability. Finally, there are the ACA rule changes—at least a dozen major adjustments, without congressional approval. Read the whole thing, and enjoy. After seven years of litigation, two trips to a federal appeals court and $3.8 million worth of lawyer time, the public has finally learned why a wheelchair-bound Stanford University scholar was cuffed, detained and denied a flight from San Francisco to Hawaii: FBI human error. FBI agent Kevin Kelley . . . checked the wrong box on a terrorism form, erroneously placing Rahinah Ibrahim on the no-fly list. . . Instead of admitting to the error, high-ranking President Barack Obama administration officials spent years covering it up. Attorney General Eric Holder, Director of National Intelligence James Clapper, and a litany of other government officials claimed repeatedly that disclosing the reason Ibrahim was detained, or even acknowledging that she’d been placed on a watch list, would cause serious damage to the U.S. national security. . .
Holder went so far as to tell the judge presiding over the case that this assertion of the state secrets privilege was fully in keeping with Obama’s much-ballyhooed 2009 executive branch reforms of the privilege, which stated the administration would invoke state secrets sparingly. . . In his declaration, Holder assured Judge Alsup that the government would not be claiming national security to conceal “administrative error” or to “prevent embarrassment” — an assertion that is now nearly impossible to square with the facts. [Theodore Roosevelt] believed then what we know is true today, that the free market is the greatest force for economic progress in human history. It’s led to a prosperity and a standard of living unmatched by the rest of the world. But Roosevelt also knew that the free market has never been a free license to take whatever you can from whomever you can. He understood the free market only works when there are rules of the road that ensure competition is fair and open and honest. The bottom line is there are folks out there who don’t want to see this program succeed, and there are folks out there who don’t want to see you get health insurance if you don’t have it. Yeah, right. We don’t want people to get health insurance. That’s exactly it. Geez. A politically connected Brooklyn pastor was arrested for a pair of open warrants — but was spared a night in jail after Mayor de Blasio called an NYPD boss to inquire about his close pal. . . Findlayter — the head of Brooklyn’s New Hope Christian Church who was instrumental in delivering the black vote to de Blasio — was pulled over at 11:21 p.m. Monday in East Flatbush for making a left turn without signaling, police said. This is how it always is under a progressive regime. They proclaim equality for all, but there are always different rules for the nomenklatura. Some are more equal than others. Law of unintended consequences, repealed! One big problem for liberal social engineers is the law of unintended consequences. They pass a law that is supposed to accomplish a goal (e.g., raise the minimum wage), but people then change their behavior to mitigate the law’s effect (e.g., hire fewer low-wage workers). Why won’t people just cooperate: change the one thing liberals want and leave everything else alone? Some lawmakers, though, have claimed that the mere threat of the employer mandate is causing companies to shed full-time workers in the hope of keeping their staff size below 50 and avoiding the requirement. Administration officials dispute that this is happening on any large scale. Further, Treasury officials said Monday that businesses will be told to “certify” that they are not shedding full-time workers simply to avoid the mandate. Officials said employers will be told to sign a “self-attestation” on their tax forms affirming this, under penalty of perjury. This is simply brilliant. Liberals have a problem with people changing their behavior to cope with their interference, why not simply prohibit that? Simply ban the unintended consequences! Why stop here? Tax increases make people cut back on business expansions. Make them attest — under penalty of perjury — that they are growing their business every bit as much as they would have. Price controls lead to shortages? Don’t let producers cut back. (It’s working in Venezuela, right?) Debasing the currency leads to inflation? Prohibit employers from raising wages. Welfare and social engineering destroying the nuclear family? Just require any single people to attest that they wouldn’t otherwise have gotten married. And if the self-attestation process has unintended consequences, just ban those too. And if it doesn’t work, at least you’ve got more ways you can harass the people you don’t like. It’s a win-win for liberals. When you no longer can be sure that there are things the government wouldn’t do, you have to base your assessments on the things that it could do. As I’ve noted, making “crazy” conspiracy theories seem more-or-less sane is one of Obama’s toxic legacies. There’s an old adage that in geopolitics you need to prepare based on your enemy’s capabilities, not his intentions. It used to be that adage didn’t apply domestically: we didn’t have domestic enemies (other than fringe elements), only opponents. But now it’s clear that Obama does view us as enemies, so we have to do the same. If a development’s projected profitability is large enough, maybe the developers will pay protection. If it’s marginal, they won’t. And here’s the thing: in a struggling neighborhood, every potential developments is marginal! Places like northeast Portland are never going to get ahead while they let self-interested community organizers speak for them. U.S. intelligence agencies last week urged the Obama administration to check its new health care network for malicious software after learning that developers linked to the Belarus government helped produce the website, raising fresh concerns that private data posted by millions of Americans will be compromised. . . It seems astonishing that they would have hired Belarusian developers to build the Obamacare exchanges, until you remember that Obamacare’s developers were chosen specifically for their ability to refuse a Congressional subpoena. Then it doesn’t seem so astonishing after all. On some level it even seems appropriate, since Obamacare is basically a malware attack on the US health care system. David Gregory tries to trap Rand Paul into playing into the Democrat-media complex’s “war on women” narrative. Paul will have none of it. I hope other Republicans learn from his example. The problem for Democrats is that they have overwhelming majorities not only in the dense, poor urban centers, but also in isolated, far-flung college towns, historical mining areas and 19th-century manufacturing towns that are surrounded by and ultimately overwhelmed by rural Republicans. A motivated Democratic cartographer could produce districts that accurately reflected overall partisanship in states like these by carefully crafting the metropolitan districts and snaking districts along the historical canals and rail lines that once connected the nonmetropolitan Democratic enclaves. But such districts are unlikely to emerge by chance from a nonpartisan process. So Republican dominance results not from Republican gerrymandering, but from the lack of Democratic gerrymandering. If you group nearby people together, Republicans win. The results were not encouraging for reform advocates. If the results — showing that reform wouldn’t help Democrats — were not encouraging to reform advocates, that tells us what the actual goals of “reform advocates” are, doesn’t it? The help line for Maryland’s Obamacare exchange connects to a Seattle pottery store. There is a historic connection between some of the arguments that we have politically and the history of race in our country, and sometimes it’s hard to disentangle those issues. It can be particularly hard to disentangle those issues when your party and you personally are doing everything you can to entangle them!
. . . I think it’s important for progressives not to dismiss out of hand arguments against my Presidency or the Democratic Party or Bill Clinton or anybody just because there’s some overlap between those criticisms and the criticisms that traditionally were directed against those who were trying to bring about greater equality for African-Americans. The flip side is I think it’s important for conservatives to recognize and answer some of the problems that are posed by that history . . . The key point that Obama leaves out here is that history of criticisms against those “trying to bring about greater equality for African-Americans” is the history of the Democratic party! Now that the Democratic party has made its 11th-hour transformation from an anti-minority racist party to a pro-minority racist party (no exaggeration), they want to project their own evils onto their opponents, who have (more or less) been arguing for a color-blind society all along. New Jersey’s “bridgegate” scandal (in which the state government intentionally snarled traffic as political payback) has certainly captured the media’s imagination. The big three networks dedicated over 34 minutes of airtime to it in a single day, which is 17 times as much as they dedicated to the IRS scandal over the past half year. And with good cause; the allegation is very serious indeed. Chris Christie stands accused . . . of behaving like a Democrat. Today’s Democratic party is rife with this sort of thing. The closest analogue is Seattle’s Democratic mayor closing city streets, out of an explicit desire to inconvenience drivers. They stopped an individual from mowing the lawn at the Lincoln Memorial. They removed handles from water fountains. They (illegally) closed Alaskan lands. They closed the Grand Canyon, and refused to let the state reopen it at state expense. They sent armed rangers to lock tourists into a Yellowstone lodge and ensure they could not see Old Faithful. They closed the only safe road through Blount County, forcing parents to take their kids to school on “white knuckle” routes. They shut down the AMBER alert web site. They (illegally) evict elderly people from their own homes. They closed the parking lot at Mount Vernon, which isn’t even government property. They barricaded highway viewing areas at Mount Rushmore. They cut off cancer treatment for children. They closed the Claude Moore Colonial Farm, which received no government funding and is operated entirely by volunteers. They barricaded national open-air monuments, and closed privately operated parks. The most recent example to come to light is how the White House took extraordinary steps to ensure that the budget sequester hurt rural schools. (Via Instapundit.) In this instance, the Agriculture Department had already determined that the sequester would have no effect on funds already disbursed the previous year. However, the White House overruled that determination, and ordered them to claw back the money they had already spent. It’s wrong for anyone to behave like this, and we do expect better from Republicans. Christie ought to be in hot water over it. But all the furor from the Democrats and their media allies over this is very much the pot calling the kettle black. If your gun stunt pleases the powers-that-be, you can break the law. Witness David Gregory. But, if your gun stunt angers the powers-that-be, you go to jail for four months and then serve two years probation. Without uniform enforcement, the law is merely a tool for the harassment of those who are out of favor. We need the rule of law. You can’t talk about the Bible; this is school! It’s worse than that. She was supposed to give a presentation on a family Christmas tradition! Then the teacher was shocked and dismayed that one student’s tradition actually had something to do with Christmas. A year ago, President Obama’s massive overreach — claiming that the presidential recess appointment power could be used at essentially any time at all — resulted in him losing the recess appointment power in nearly its entirety. Now the Supreme Court appears poised to confirm that ruling. To be clear: when Democrats talk about uniting red America and blue America, they don’t mean by respecting diversity of thought. They mean that red Americans must become blue, or else. UPDATE: Cuomo: I never said what I said. I would have thought it hard to accuse people of being “entirely reckless with facts and the truth” when they quote you verbatim, but he’s up for it. The Environmental Protection Agency has told farmers and ranchers it is sorry for handing private information about them over to environmental groups, but agriculture advocates who fear attacks from eco-terrorists say it’s like closing the barn door after the horses escaped. In response to Freedom of Information Requests, the federal agency released information on up to 100,000 agriculture industry workers, including their home address and phone numbers, GPS coordinates and even personal medical histories. Whether this was accidental or not is beside the point. If they face no consequences, it will keep happening. More than two-thirds of the 250,000 people whose health policies the state Division of Insurance said last week were “terminated” have actually been offered renewals of existing plans through 2014, according to research by U.S. Sen. Mark Udall’s office. . .
Insurance companies have been sending out cancellation notices to consumers with plans that don’t meet minimum benefit levels required by the health care act. . . Many of the cancellation notices, however, also contain language allowing customers to renew their existing policies. (Emphasis mine.) According to “research” by Udall, who previously tried unsuccessfully to pressure his state to fudge the cancellation numbers. What would it even mean to send out a cancellation notice that allowed the customer to renew? That’s simply a contradiction in terms. I’ve looked at hundreds of cancellation notices at mycancellation.com and I’ve never seen anything that could possibly be described this way. We are asked to believe that there are hundreds of thousands of such self-contradictory letters in Colorado alone. Were that true, they could include at least one example. The median household income in New York City is $50,711, so health insurance is quite literally unaffordable, it would cost over half the typical family’s income. Obamacare is different, as it includes an individual mandate. This is supposed to prevent the death spiral: prices soar (boy, do they), but the healthy aren’t allowed to flee, so prices don’t soar further. There’s a couple of problems with the theory though. First, the individual mandate’s penalty isn’t really severe enough to force people into the market. Many people will pay the penalty rather than sign up for expensive insurance they don’t think they need. In fact, the fact that the penalty isn’t severe enough is part of why John Roberts was able to convince himself that it could be construed as a tax, not a penalty, and thus found constitutional. If the mandate actually worked, it would be unconstitutional. Second, as I’ve noted before, the quality of health insurance is not uniform. Even if the mandate worked, it doesn’t force healthy people into good plans. Consequently, good plans will become unaffordable and cease to exist. If it wasn’t clear that Democrats are running scared from Obamacare, check out this Star Tribune column explaining that Al Franken (D-MN) wasn’t really the 60th vote for Obamacare. In fact, no one was! They’ve abandoned “Obamacare is good” and are now attempting “it’s not my fault.” I don’t think it will work any better. The White House said in two Statements of Administration Policy that it opposed both bills, one of which is set for a Friday vote in the House. . .
Got that? They are against warning people who they have made vulnerable to identity theft, because — don’t drink a beverage right now! — it’s too expensive! They waste trillions on one boondoggle after another, but suddenly become miserly when it comes to notifying people that they screwed up and exposed them to identify theft. The White House said it opposed the bill, arguing the government already has plans to tell people if their information has been compromised. We oppose it because we plan to do it anyway. Pinky swear! Sheesh. That’s so lame even his own party isn’t buying it. But never mind all that, because it’s nonsense. The Obama/Holder Justice Department considers political affiliation in personnel decisions all the time. Indeed, it appears to be their primary consideration. For example, every single one of the people hired by the Civil Rights division was a leftist. No conservatives, no moderates. 113-0-0. Now they’re going to pretend that they are so punctilious about ignoring politics that they couldn’t possibly choose an appropriate investigator? That doesn’t even pass the laugh test. Colorado senator Mark Udall (D) asked his state’s insurance regulators to cook its numbers to reduce the number of people receiving cancellations notices because of Obamacare. To their credit, Colorado’s regulators refused. Lynne Stewart, the lawyer who facilitated terrorist communications with Sheikh Omar Abdel Rahman, has been released by the Obama administration. In 1974, the polar vortex phenomenon was evidence of global cooling. Now it’s evidence of global warming. Jerome M. Hauer, Gov. Andrew Cuomo’s director of homeland security, took out his handgun and used the laser sighting device attached to the barrel as a pointer in a presentation to a foreign delegation, according to public officials. . . These officials, one of whom claimed to be an eyewitness, said that three Swedish emergency managers in the delegation were rattled when the gun’s laser tracked across one of their heads before Hauer found the map of New York, at which he wanted to point. [Hauer] isn’t a law enforcement official. He carries the loaded 9-millimeter Glock in a holster into state buildings, an apparent violation of state law barring state employees from bringing weapons to the workplace. . . Appalling. He should be required to take an NRA gun safety class. Perhaps the version for kids. One Oregon mother says that she is unable to afford health insurance for her and her 18-month-old son because it’s too expensive. The woman — who wishes to remain anonymous — tells KOIN-TV that she originally championed President Barack Obama’s signature health care law because she thought it would help people in her situation. ASIDE: What, the online calculator lied? Imagine that. She thought that the feds would help her profit at the expense of others, but it turns out all the got was skyrocketing premiums and no subsidy. Which is what happens when you call the Feds. The FBI’s creeping advance into the world of counterterrorism is nothing new. But quietly and without notice, the agency has finally decided to make it official in one of its organizational fact sheets. Instead of declaring “law enforcement” as its “primary function,” as it has for years, the FBI fact sheet now lists “national security” as its chief mission. The changes largely reflect the FBI reforms put in place after September 11, 2001. . . The Obama administration has announced that it will weaken the HIPAA rules that protect the privacy of individuals’ health records. They wants government bureaucrats to have access to mental health records so they can use them to deny patients permission to purchase firearms. In 2003, under pressure from the gun lobby, Congress passed a law that hid from public view the government database that contained the gun tracing information. The Washington Post has obtained the names of the gun dealers nationwide with the most traces over the past four years. In addition, The Post has uncovered the names of the dealers, all from border states, with the most traces from guns recovered in Mexico over the past two years. It was illegal for the government to disclose the information, but they did it anyway. And this wasn’t just a few “bad apples”, either. There was never any investigation of the leak, so DOJ policy-setting officials were complicit, at least after the fact. A grammatically unintelligible provision limiting “large capacity” (i.e., normal capacity) magazines. One thing this does make clear (particularly the first and third) is that the people who wrote the bill had no idea what they were talking about.